I love the farmers market and would visit more often if they weren’t spread out so far around SLO County. I have some favorite farms which I always head to first like Johnson Farms and SLO Grown Produce. Once I’m stocked with those necessities I stroll around choosing fresh fruit and produce that catches my eye: sweet raspberries, ripe Haas avocados, and sometimes add those beautiful long stem roses sold at the Arroyo Grande market. The market is a wonderful social place where you’re likely to strike up a conversation with a stranger (possibly a local chef) in line beside you while you wait to get your share of the best tomatoes or the sweetest blueberries. I especially like the fact they have been bringing in cooks like the soup lady and the young ladies selling handmade loaves of rye bread and decadent chocolate chip cookies. The farmers market is great if you have the time for it. VEGGIE LINE : Drew Summerfield, Andrea Chavez, and Adam Stevens pack over 100 boxes of fresh produce from Talley Farm which will be delivered latter in the day. Another cool part for me is running into all the chefs who shop the market before heading to their professional kitchens. We usually share industry gossip, which I can’t resist. I realize that most consumers who work all day while raising a family don’t have the luxury of time to spend at the market. That’s why you’ll see more retired people filling their cloth grocery bags or spacious wicker baskets. For people with limited time available a CSA (Community Supported Agriculture) program can provide you with the farm fresh foods I’m buying at the farmers market. Imagine picking up your box of produce and berries freshly harvested that morning that is delivered to a business that’s close to your home. And if you love wine as I do, there’s a new local CSA you’ll be eager to join, where you pick up that box at Talley Vineyards. The Talley family is renowned for their premium quality wines and viticultural practices, but did you know they are equally respected for the quality of their fruit and vegetables? It began when Oliver Talley leased farmland from the Biddle Ranch and created Talley Farms in 1948. All of their premium quality, freshly harvested products were always shipped to the East Coast. Now locals can fill their refrigerators with those delicious bell peppers, lemons, avocados, and berries by joining Talley Farms CSA program called “Fresh Harvest.” Each week you’ll receive an email noting what’s in your next box of goodies, a tips sheet about storing the produce, and new recipes worth trying out. It’s a bounty of good fruits and vegetables for only $24 each week, and I spend more than that at the farmers market each week. 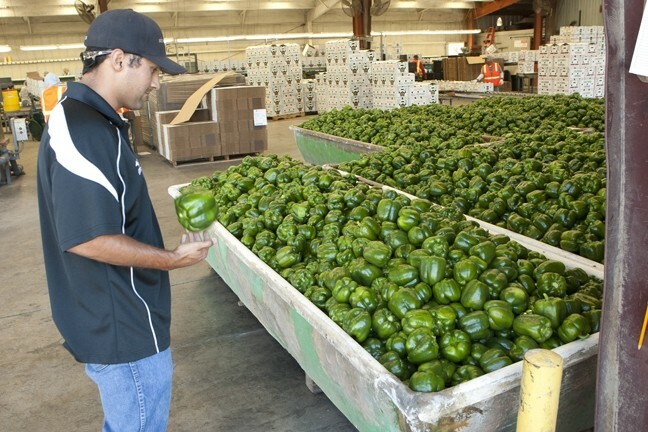 HULK BERRIES : Robert Meyer, bell pepper supervisor and organic specialist, looks over a sea of green peppers which are ready to be cleaned and packed. “It’s like buying from neighbors,” said Andrea Chavez, hired by Talley Farms to set-up and manage their CSA program. She explained that they provide organically grown produce as much as possible, and the produce is all grown in local farms. “The seasonal box always includes salad ingredients, dinner vegetables, and fruit. 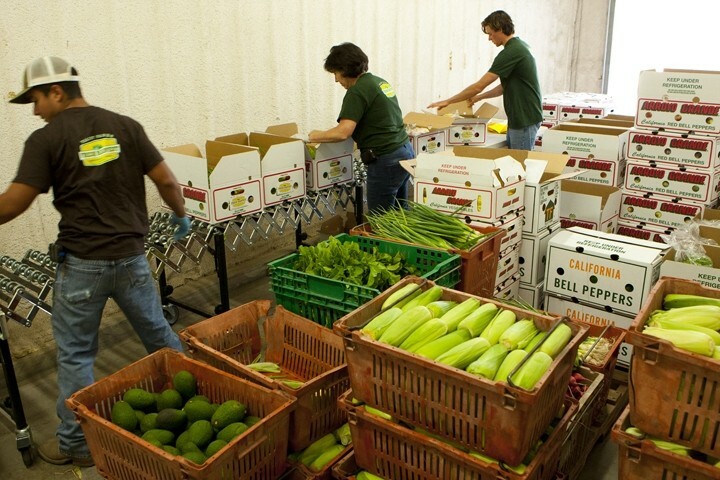 There are always 10 to 12 products, and we’re planting now so that we will have produce available year round.” A Cal Poly alumna class of 1980, she’s worked as a produce broker all of her career working in Seattle and Los Angeles. Once her children left for college, she and her husband decided to relocate to the Central Coast. A friend she once worked with knew the Talley family and recommended her highly, and the job practically fell into her lap. Chavez works with other small farmers to bring in freshly harvested produce and fruit for the CSA program that isn’t grown at Talley Farms. For instance: she buys Blenheim apricots grown in See Canyon by Mike Cironi who also grows 84 varieties of apples; raspberries from Seaview Farms; and has a farmer in Nipomo growing kiwi that will be in the boxes soon. “Locavores love this program because it all stays in the community,” she noted. Pick up locations are at Miner’s Ace Hardware and Farm Supply Company around SLO County. You sign up online with a credit card but you aren’t charged until the day of delivery, and you can customize your orders through Chavez, perhaps choosing to pick up every other week, or to increase the size of your order. 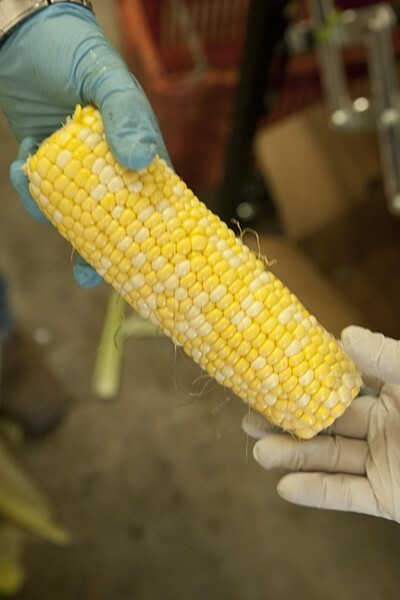 GMO FREE : Seasonal produce for the summer CSA boxes includes fresh organic, non GMO corn. I also learned that nearly all of the residents of Las Ventanas, who live in a spectacular rural setting with ocean views, signed up for Talley Farms Fresh Harvest which they pick up at Talley’s tasting room. Now run by the third generation of Talley’s with Brian, Ryan, and Todd managing the businesses, each generation of their children start out working at the Talley Farms picking green beans and move up the ladder to better appreciate the farming life. To learn more about Talley Farms Fresh Harvest and sign up to receive those custom-filled produce boxes visit TalleyFarmsFreshHarvest.com, or call Talley Farms at 489-5401. Chavez, their personable produce expert, will gladly help you with all of your produce questions and provide cooking tips. With three generations of Talleys driven for “excellence in everything,” you’re sure to love their fruit and vegetables as much as you do the excellent wines from Talley Vineyards.